Installing and maintaining a permanent swimming pool structure can be very expensive and time consuming. Getting a permanent pool structure installed can take up to several weeks and can often require expensive landscaping once the project is completed. If you are not comfortable with the commitment level of a standard swimming pool, an inflatable pool is a popular alternative. They are quick and easy to set up, require minimal maintenance during the swimming season and can be easily dismantled if you decide you no longer want a pool in your yard. Read all instructions carefully before starting set up process. If pool comes with video, watch this as well. Determine where you want your pool within your yard. The area should be level, free from sharp objects and near an electrical source if your pool has a filter. Spread out the pool in the desired location. 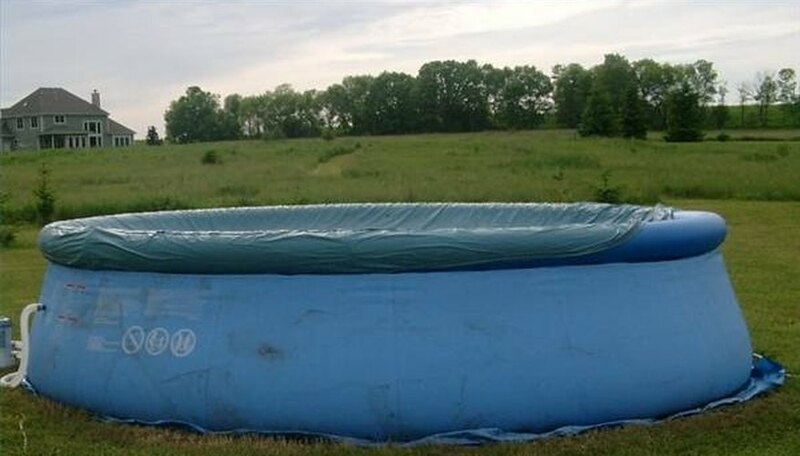 If your pool comes with a ground tarp, place this down before spreading out the pool. Make sure the drain hole is closed. Inflate the pool with an air compressor as determined by the manufacturer's directions. Fill the pool with a few inches of water and work your way around the bottom to remove any wrinkles and bubbles. This will ensure a smooth bottom surface. 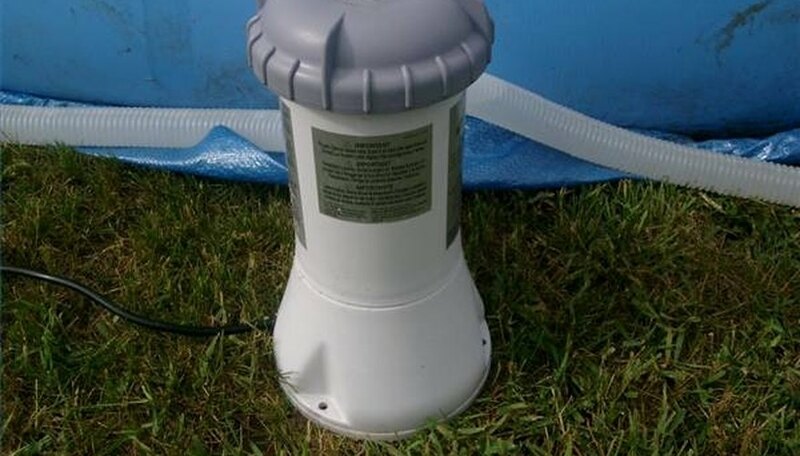 Place stoppers in filter holes if your pool comes with a filter. Use a hose to fill your pool with water. Fill to the manufacturer's recommended water level. 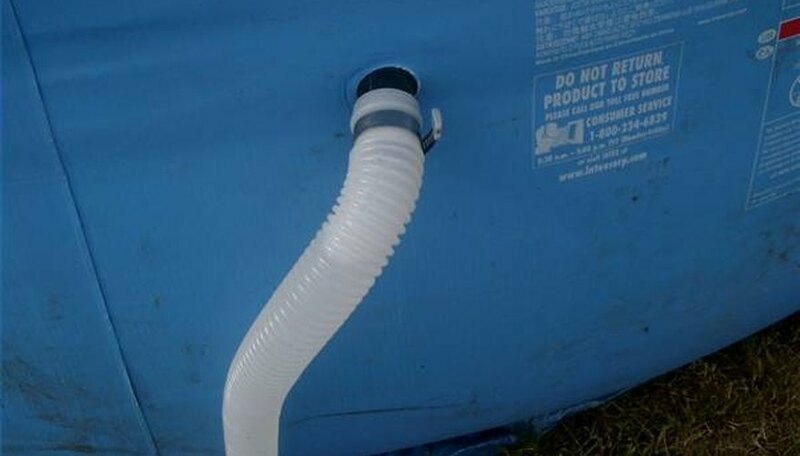 Attach the filter to sides of pool as directed by the pool manufacturer. Insert the paper filter into the plastic filter housing if it is required. Add pool chemicals as directed by pool manufacturer. Turn on the filter and run it for at least 8 hours so that chemicals can be worked through the pool water. Check the pool water with a test kit before swimming to ensure the chemicals are in balance. Be careful not to over inflate the pool. This could pop the pool or make it more susceptible to tears and holes. The correct chemical balance is a pH level between 7.2 and 7.6, alkalinity between 100 and 150 parts per million (ppm) and chlorine levels of 3.0 ppm. To avoid possible electrocution, never use an extension cord. The pool filter should be plugged directly into a power source.